About 60% of people on the internet use Chrome to browse. This tells you how many businesses stall or make losses when the browser fails to work well. In the recent past, the question “Why does my website say not secure on chrome?” has been common. Anyone who cares about their online security would be sceptical about opening a site that’s not secure. When a website displays that it’s not safe, it means that third parties can track your information online. Google recently sent a message to its users. It warned them that Chrome would now show security warnings on websites. Our guess is that you want to know what this means. What Does a Website Not Being Secure Mean? The standard way for communication between your computer and websites is a protocol called HTTP. This is the short form for Hypertext Transfer Protocol. For a site to display the HTTP protocol in the URL, it must use a security certificate known as SSL. The security certificate is responsible for protecting the communication that goes on in your computer. This makes it hard for people to hack or steal the information you pass online. With the roll-out of the “not-secure” warning, sites that don’t use the HTTPS protocol will appear less safe. In actual sense, however, nothing has changed about the security status of the websites. There’s also no harm in installing the security certificate on your site so that it can display the HTTP protocol. Answering the question “Why does my website say not secure?” should be easy by now. When Chrome browser displays “not secure” on your site, it means the SSL protocol is not in use. In other words, Google is sending a message to your visitor that the site is being transmitted over HTTP only. Although HTTP is the data transfer protocol, a site with the “not secure” mark means it lacks the SSL benefits. HTTP is a reserve for SSL certificate, which ensures all data remains encrypted from the server to the browser. When Google started marking websites as “not secure” the aim was to have them install the SSL certificate. Does This Apply to All Browsers? The “not secure” warning doesn’t show on all browsers. If you’re using Firefox, Internet Explorer, or Safari, the message won’t be displayed in the same way as on Chrome. Users will be updated when they visit unsecured sites but in a slightly different manner. One way that the warning will affect your site is that visitors will be wary of opening it. Anyone who’s cautious about their privacy would avoid providing your site with their details. The notion they get is that your site is hacked or vulnerable. If these users are not inclined to using other browsers, the chances are that you’ll lose out on business. Your ranking on Google will also be affected. In the change of policies, Google requires site owners to have the SSL certificate. Proper conversion of the URL through SSL is now a ranking factor. Given the above Google changes in security policy, website owners have no choice but to upgrade. For the successful completion of this process, you’ll have to purchase an SSL certificate and install it. This will ensure the conversion of your URL to the HTTPS protocol through a secure medium. Take note of the change from HTTP to HTTPS. The latter indicates that security is enhanced. Without the SSL certificate, it’s not possible to cross over from HTTP to HTTPS. After installation of SSL, ensure every page is served on an HTTPS protocol. Although the bigger idea would be to move the entire site, the effect might fail to take off on specific pages. The best way to deal with the question “Why does my website say not secure?” is to install an SSL certificate. During the process of installation, keep a few things in mind. One of the big issues is that there’s a cost involved in the transition. The certificate is affordable, but it’s a cost worth adding to the hosting of your site. However, if you’re can’t afford the extra cost, you can choose the free SSL certificate offers. When changing your sites protocol from HTTP to HTTPS, remember that you’re changing all your URLs. These changes are what Google refers to a site move, which means that you’ll see the new indexes of your pages. You’ll also see your website rankings concerning traffic, and the declines made. Some of the adverse effects you should expect from this process include broken links. Since you’re creating new URLs, you should expect that some of the links will lose their initial configuration. You should ensure that the 301 redirects are corresponding to their new HTTPS URLs. Besides, you’ll most likely lose data from Google Search Console. Search consoles treat the HTTPS protocol as a separate element; hence, they don’t automatically share data. Ultimately, the discretion to use HTTPS is entirely yours. The recommendation from experts is that this would be the best way to go. Increasing the security of your site is almost a guarantee that you’ll continue to have an online presence. You’re at that point that you want to install the SSL certificate. Before taking any action, it’s recommendable to crawl your site and export the crawl. This means that you’ll copy all your site links and store them safely, just in case the installation doesn’t succeed. A majority of hosting service providers have an offer for SSL certificate that you can easily add-on to your site. If we host your site, you might not have this offer, and you’ll need to incur a cost to purchase the certificate. Some hosting services offer you the option of the free or paid certificate. Once you’ve added the license to your site, activate it for it to work. Sometimes the hosting site will do the activation or walk you through the process. In case of issues, contact your host’s support to help you complete the process. Once the certificate is active, use it to verify the security protocol of your site. The certificate will encrypt all your data right from the time you activate it going forward. If you’re using WordPress for your site, you can make use of the ReallySimpleSSL plugin. It automatically activates itself, detects your settings, and configures the site for compatibility with HTTPS. Most of the sites that Google is marking as “not secure” are raising concern among visitors. Viewers would be reluctant to fill any forms on a website that’s likely to compromise their online security. The move to make sites install the SSL certificate will have websites that comply marked as safe. Apart from this, a site with an SSL will benefit from better rankings. The internet will become safer for browsers on a larger scale. Google will continue to run tests for sites that run secure and encrypted connections. The aim is to come up with ranking algorithms. There are already positive results from the process, and therefore the HTTPS factor will soon be a ranking signal. Google will continually make improvements to the protocol to make it stronger. At this point, it’s good to test how well the new HTTPS protocol is doing. Another advantage of installing SSL certificate is that your site will be protected from malicious ads. Most of the advertisements that find their way to HTTP sites can’t penetrate an HTTPS website. This spelt good news to investors initially as there was less competition for secure publishers. If the HTTPS protocol is so good, why are many sites yet to make a move? The answer lies in the challenges experienced in the migration. There are three main areas of concern for site owners. These are how redirection takes place, whether the move will lower revenue, and how it affects traffic. To address these concerns, it’s essential to note that redirecting a site isn’t complicated. In most cases, all that’s required of you is to change a simple setting on the host to install the SSL on all pages. Migration can happen at the server or canonical level on the page. It’s a process that takes about three minutes to complete. Contrary to popular belief, you don’t need to use spreadsheets for the procedure. This is unless you’re doing website migration at another level. Does HTTPS protocol lower revenue? Initially, it would have been complicated to answer this question. However, as more sites have embraced the new move, the answer is no. Most of the ads that drive traffic to an HTTP site cannot get access to an HTTPS site. This fact meant less competition among secured advertisers, but this has changed with time. The current trend shows that your income will positively be affected. On the question of impact on traffic, visitors should now see the secure site lock. While the “not secure” signal would drive visitors away, a secure lock will encourage them to visit the site. This means that the move will boost traffic and probably increase your sales. What Does the Not Secure Sign Mean for Visitors? If you’re a site visitor, you also might be asking “why does my website say not secure” in regards to sites you visit. The reason you see the warning is that the webpage doesn’t have a secure connection. 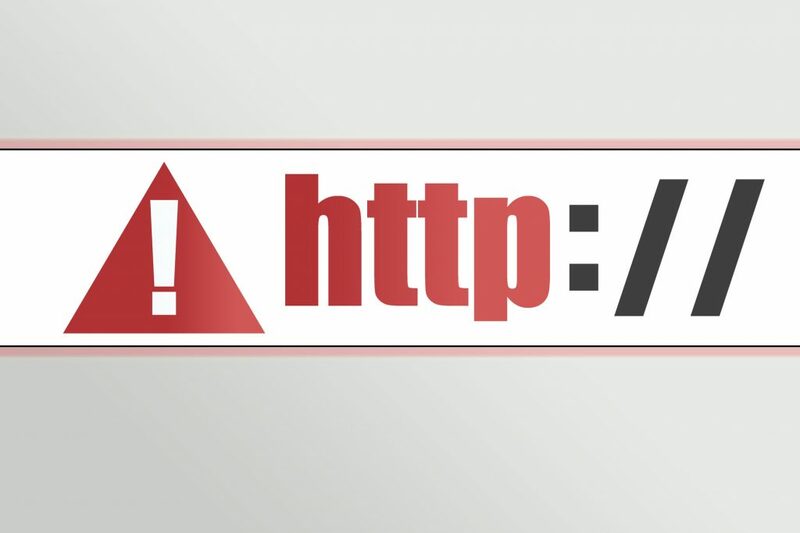 When opening any site, it’ll display an HTTP (insecure) or HTTPS (secure) connection. All pages using the HTTP protocol will show the “not secure” sign. It means that Chrome thinks their security could be compromised, although not necessarily. For your safety, avoid conducting any personal business on such pages. Apart from losing your personal information, a site that is not secure could direct you to sites with information not condoned in your jurisdiction. Don’t think of trying to fix this warning because as a visitor you can’t. The problem can only be solved when a web administrator acquires a security certificate. After installation, the HTTPS protocol will be enabled, and the site will be safe to visit. If you need to visit a site that continually displays the “not secure” sign, you can try modifying the URL by replacing HTTP with HTTPS. Sites with partial support for the HTTPS protocol will give you safe access. Alternatively, you could contact the site support and request to make the modifications from their end. Keep in mind that no matter how basic your browsing is over an HTTP protocol, the information you’re reading could be modified or monitored. This means that your privacy will be compromised and you could be attacked. If you’ve been experiencing an unsecured connection over Google, you might be asking “why does my website say not secure?” The reason is that you’ve not yet installed a security certificate. You can get this by purchasing or using the free versions of SSL certificate. Once you’ve installed it, ensure your URLs are preceded by HTTPS and not HTTP. The ‘S’ at the end is an indication of security enhancement. Remember that leaving your site unsecured could cost your business customers and money. The process of securing your site isn’t complicated. In case of challenges in the process, consult professionals. This might be costly, but by all costs have the security certificate installed. If you have any question about website SSL, feel free to contact us today.